Let’s face it, double flowering petunia doesn’t have a great reputation. With the vast majority raised from seed, varieties tend to be late flowering, with poor plant habit and very poor resilience to rain. Surfinia Summer Double plants overcome all these issues in three beautiful colours of Pink, Rose Pink, and White. The breeders have done an exceptional job in selecting only those colours that have the Summer Double performance qualities required that overcome the poor performance of their seed relatives. The three colours are also very complimentary, and allow users to mix and match as they please. The plants featured in these images were grown outside, under full sun conditions from October to December. 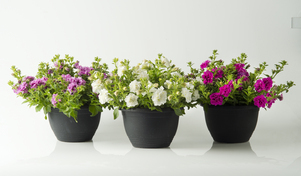 The hanging baskets are 250mm in diameter and contain just one plant. No plant growth regulators were applied and/or pruning undertaken during their production. The vigorous branching habit allows the plant to stay very compact, while at the same time providing many shoots for flowering; and flower they did! The flower size is not excessively large, which allows the blooms to retain their quality after periods of rain or overhead irrigation. The reduced flower size also means the blooms are not too heavy, which helps keep Summer Double plants in great shape, literally. Whether it’s the original ‘trailing’ varieties, the more recent ‘patio’ and ‘bouquet’ varieties, or ‘Summer Double’, there are Surfinia® varieties for all applications. Professional garden managers across Australia enjoy the labour savings as a result of the vigorous growth unique to Surfinia®. Home gardeners have trusted in the reliability of Surfinia® for nearly 20 years to create amazing floral gardens under Australia’s tough summer conditions. Under heavy rain or periods of dry weather, Surfinia® plants are in a class of their own.